ahatma Gandhi said that “the best way to find yourself, is to lose yourself in the service of others.” Kerry Chhay (pictured receiving an award in the middle) is the embodiment of service to others beyond measure who discovered himself in the process. He is just an ordinary person who faces life struggles like anyone else does. However, he does not let anything deter him from lending a helping hand whenever and however he can. Kerry was born to Cambodian refugees and grew up in Long Beach. Despite living in the heart of the largest Cambodian population outside of Cambodia, Kerry was not exposed to the Cambodian culture. His first experience with the Cambodian culture was when he performed a traditional dance called Robam Krab as a Cambodian Student Society member at Cal State University Long Beach (CSULB) in 2011. Shortly after, he met Pasin Chanou, Cambodia Town chairman, during his minor program for Entrepreneurship with Ethnic Studies at CSULB. Some of Kerry’s contributions include participating in the groundwork for the Midtown Property Improvement District (Midtown PBID), doing research as an intern under the Families in Good Health to produce data on the health and economic status of Cambodians in Long Beach, and being involved in Educated Men with Meaningful Messages (EM3) workshops to promote healthy relationships. 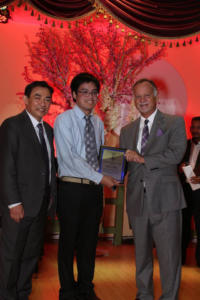 In addition, he was selected as an awardee of the Cambodia Town Spirit Award in July this year. Currently, one of the projects that he is involved in is the construction of a community garden at Mark Twain Neighborhood Library in Long Beach. This project entails constructing 25 raised garden beds. During the first phase on November 17, the team built, arranged, and painted five of them. Kerry earned a Bachelor’s in Asian-American Studies degree from Cal State Long Beach in 2016. At 27 years old, he remains humble in spite of his education, accomplishments, and recognition. With his servant heart, he never passes up an opportunity to help. Whether it is dressing up in a traditional Cambodian costume and walking miles in a parade, picking up a broom to clean the streets and sidewalks, or peddling his bike from Long Beach to Seal Beach (that’s approximately six miles) to volunteer for an event, Kerry is always there on time and ready to work come rain or shine. Anyone who has worked with Kerry can attest that he replies to every text message, phone call, e-mail, and mostly bikes to meetings or events. No task is above or beneath him, and he is usually one of the first to show up and the last to leave. At such a young age, he is a consummate professional with an impeccable work ethic, and he is reliable and works well with just about anyone. He has a can-do attitude and has never complained about any task that has been asked of him. Many people have the misconception that you have to be rich to give or have a prominent status to make a difference. However, Kerry is proof that anyone can make a difference by making an effort or taking the time to get involved and help others. We all have the capacity to give.